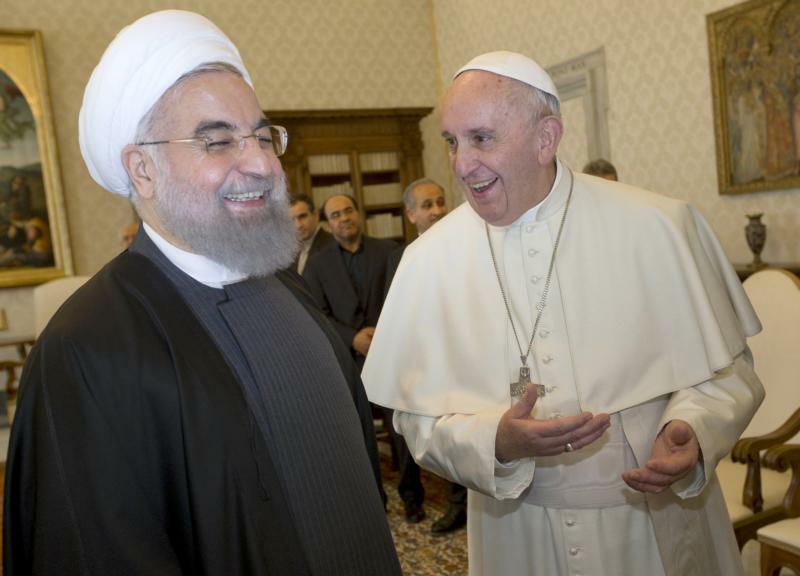 VATICAN CITY (CNS) — Meeting with Iranian President Hassan Rouhani at the Vatican, Pope Francis told him he had high hopes for peace. President Rouhani, who was in Europe to build political and economic ties after Iran’s historic nuclear agreement, met with the pope Jan. 26 for 40 minutes of private talks with the aid of translators. The president then had a separate meeting with Cardinal Pietro Parolin, Vatican secretary of state. The recent international agreement limiting Iran’s nuclear program was discussed as well as “the important role Iran is called to play with other nations in the region in promoting adequate political solutions to the problems that afflict the Middle East, opposing the spread of terrorism and arms trafficking,” the Vatican said in a written communique. When he convened a Middle East summit at the Vatican in 2014, Pope Francis had said that arms trafficking was the root cause of many problems in the region. Also underlined during the Jan. 26 discussions were “the importance of interreligious dialogue and the responsibility of religious communities in promoting reconciliation, tolerance and peace,” the Vatican communique said. “During the cordial conversations, common spiritual values were highlighted” and “the good state of relations between the Holy See and the Islamic Republic of Iran” was recognized, the Vatican said. The small Catholic community in Iran dates back to the church’s early centuries and has had a long history of living in harmony with the Muslim majority; there are some restrictions on full religious freedom, including the risk of the death penalty for those who convert from Islam. After their closed-door meeting, Pope Francis greeted the 12-person Iranian delegation and accepted two gifts from the president. Speaking in Persian, Rouhani said the intricately designed rug he was giving was “handmade in Qom,” a city considered holy for Shiite Muslims. He also gave the pope a large book of reproductions of Persian miniatures painted by Mahmoud Farshchian, who lives in the United States. The pope also gave him a copy of his encyclical letter “Laudato Si'” and told him the document was “on the protection of creation.” The pope apologized there was no translation of the document in Persian, but “I’m giving it to you in English” and he explained a copy in Arabic is online. Rouhani then replied through a translator, “I ask you to pray for me,” and told the pope it had been “a true pleasure” and wished him good luck with his work. Mohammed Khatami was the last Iranian leader to meet a pope for private talks at the Vatican. In addition to his meeting with St. John Paul II in 1999, Khatami also attended St. John Paul’s funeral in 2005. While former President Mahmoud Ahmadinejad attended a U.N. summit in Rome in 2008, he did not visit the pope or hold an official state visit with Italian leaders. Rouhani, a former lawmaker and diplomat, was visiting Italy and France, meeting with those nation’s leaders in the hopes of re-establishing stronger diplomatic and commercial ties with Europe after decades of sanctions. He ran his 2013 presidential campaign on a platform calling for greater openness, transparency and establishing trust with the wider world. In July, Iran reached a landmark agreement with six nations, including the United States; the agreement allows U.N. inspectors to include military sites in its monitoring of Iran’s nuclear activity. While a U.N. arms embargo would remain in place for the near future, other sanctions on trade and assets were to be eased.